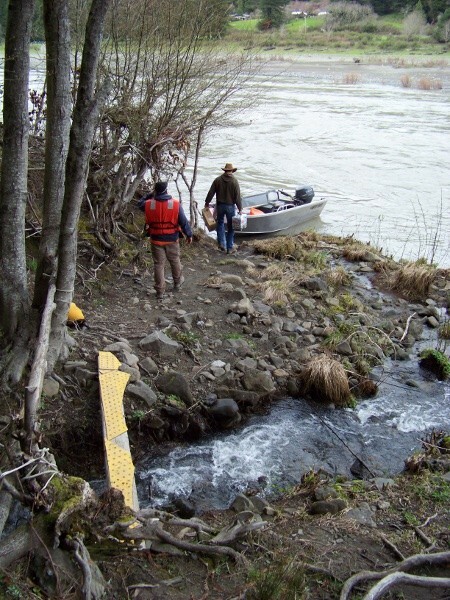 A couple winters have passed since the federal department of transportation awarded $120,000 to Humboldt County to make improvements to the McCann Ferry -- a couple of winters, and numerous high-water boat trips back and forth across the Eel River by the intrepid boatman and handful of residents who live on the cut-off side of the river. When the water rises high enough to inundate their low-lying bridge, they have to rely on that ferry boat to get to and from work, school, shopping and everything else. When the winter rains are over -- usually by June -- and the bridge, which is partly just a gravel ramp, emerges, they can drive across it again. The award -- among $39 million total in grants to ferry systems across the United States that were announced in October 2010 -- is to be used to put in ADA-compliant ramps and launches, construct a waiting area for passengers and the ferry operator, and buy a new boat, motor and safety equipment. Well, wondered resident Trisha Whitlow recently, where are the improvements? "Just to let you know we have not seen one cent of that grant," Whitlow wrote last month on the Journal's website. "They fixed a different trail with pea gravel but it is not much for some one that can hardly walk down." It turns out, however, that Whitlow and her grandfather, Oral Whitlow ("Papa"), have had just enough time, waiting on the ferry improvements, to ponder what they'd really like to see happen. "The current boat is only four or five years old," Trisha said when we called her up this week. "And Papa says a boat lasts 10 years. That county boat is still in mint condition. Papa said we don't need the money for a new boat at all, or an engine. And the ADA compliant ramp and launches they were talking about putting in? Papa says that's ridiculous, because they want to put them in the creek -- and when creek is up, the ramp would wash out. Why not use the grant instead to put an extension on the bridge?" As for the promised improvements -- these things take time. Hoops to jump through, approval letters to receive, maps and studies and permits ... . The county only just now has been cleared to enter the environmental review phase. "It will probably be next summer before any construction begins," Mattson said. And it won't be a bridge.